The bulbous structure was built to house Abwab – an exhibition of 47 selected designs created by designers from 15 countries within the MENASA (Middle East, North Africa and South Asia) region. 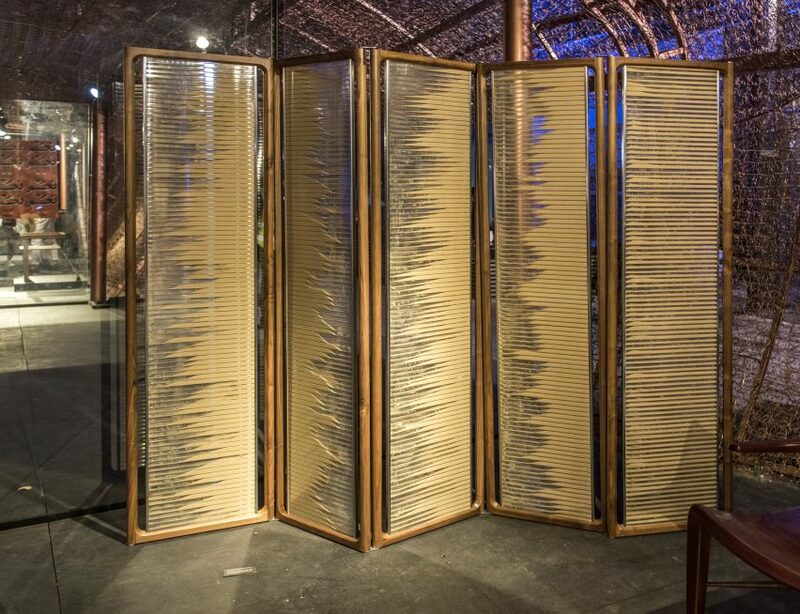 The Abwab pavilion programme, meaning “doors” in Arabic, was launched at the inaugural edition of Dubai Design Week in 2015 and is now in its third edition. 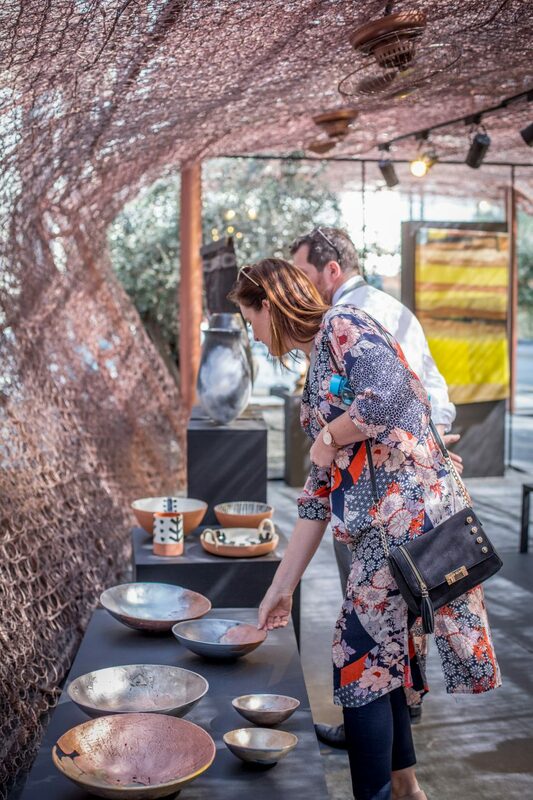 Each year, the showcase provides visitors with an insight into techniques, materials and craft of countries within the MENASA region. Unlike previous years, where each country showcased work in an independent pavilion, this year saw all the MENASA designers’ work grouped together to create a single exhibition with eight categories: interpretation, mimicry, intersection, geometry, tactility, artisanal, nostalgia and re-use. 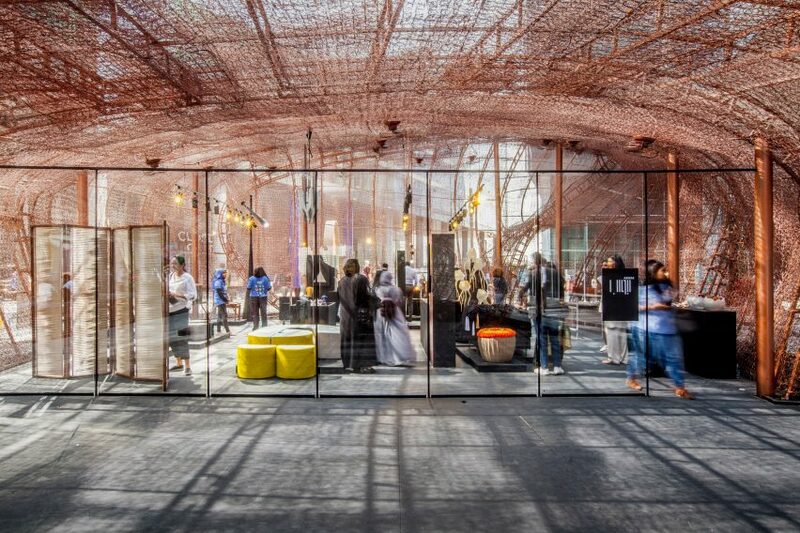 UAE-based Fahed + Architects were asked to create the pavilion using material sourced from waste management company Bee’ah. The architects chose to use the mattresses because of their strength, lightness and silhouette, which in mound-form recalled ocean waves. 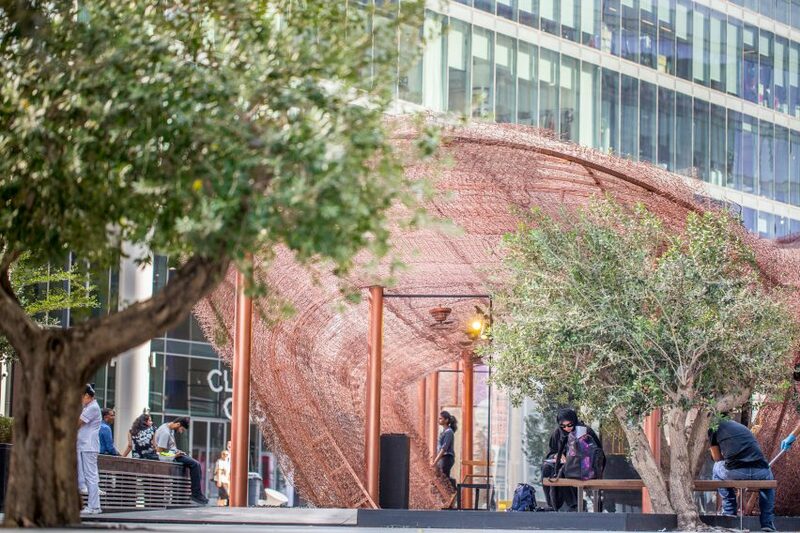 “Located within the outdoor D3 corridors and set against large mass of buildings, we set out to erect a structure that floats like a cloud to invoke hope,” the firm said. 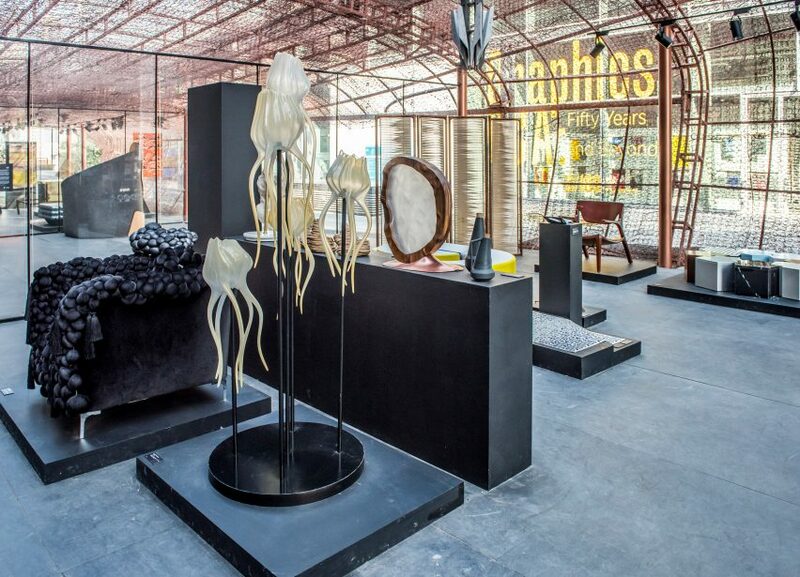 Inside the pavilion, 47 designs created by designers from 15 countries were displayed across plinths. Using a peer-selection process, the featured designers were each nominated by Abwab alumni and then edited down by an international board of high-profile names from within the design industry. Board members included Joy Mrdini, director of JM Design Gallery; design commentator, Max Fraser; Sheikha Lateefa bint Maktoum, founder and director of Tashkeel; and Rawan Kashkoush, creative director of Abwab. The Abwab team hopes that the new “domino” selection process will help to build a community around the annual project. “We discovered over 250 designers, some of whom I had never heard of, yet they had all been working in the design industry for years,” commented Abwab creative director Rawan Kaskoush. Featured designs included a set of folding screens by UAE practice Loci architecture, who also designed the first ever Abwab pavilions in 2015. Using the same technique that was used to create the original Abwab pavilions, the screens were created from polycarbonate panels, filled with desert sand to filter the light. Graphic designer Rasha Dakkak created a contemporary prayer mat that features two words from the call to prayer –Salāh (hurry to pray) and Falāh (hurry to success) – that morph into each other across the length of the mat. Each word is repeated five times to reflect the five daily prayers. 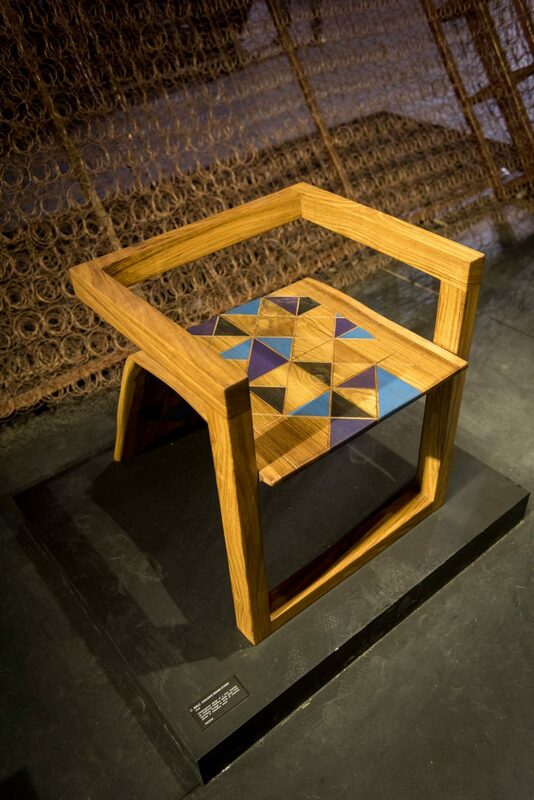 Pakistan-based Coalesce Design Studio contributed a contemporary chair made from sheesham wood engraved with a decorative geometric design inspired by traditional Pakistani textile patchwork techniques. 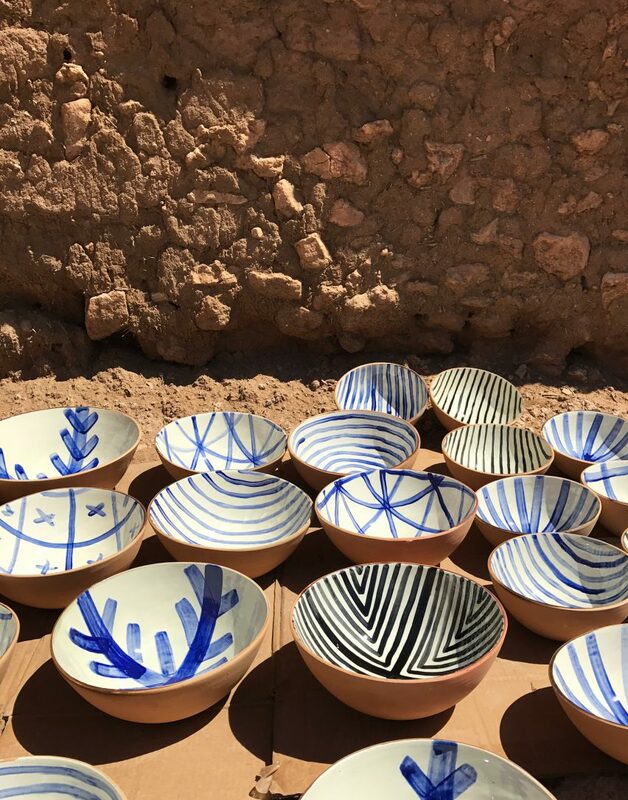 From Morocco, Bouchra Boudoa showcased a tableware collection made from locally sourced clay inspired by old mud houses in Berber villages. Dubai Design Week took place from 13 to 18 November 2017, with the aim to strengthen Dubai’s position as a global hub for the design and creative industries. 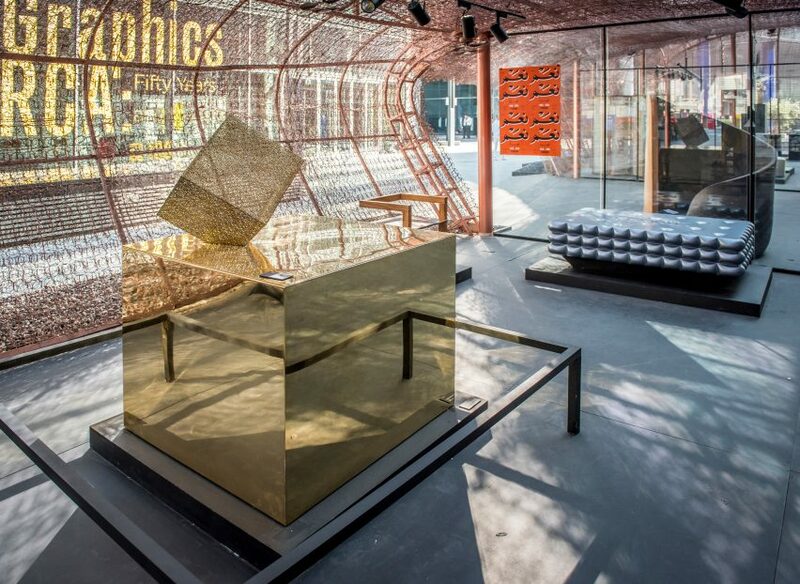 Now in its third edition, the week involved over 550 designers who exhibited work at 200 events across the city. The Dubai Design District, which acts as the hub venue, is a creative quarter being built from scratch in the United Arab Emirates city. With phase one of three now complete, the second phase – a creative community of studios, galleries and a school designed by Foster + Partners – is expected to open in 2019.